Leopard Sweater: J.Crew Factory (old) love this and this, Button up: Forever 21, Red Sweater: Crystal Feather Boutique c/o love this coat, Skirt: J.Crew, Boots: Hunter, Bag: Phillip Lim, Necklace: Emerald Bling c/o, Bracelets: Pink Pineapple Shop, Forever 21, Stella and Dot, Lips: MAC Lady Danger, Sunglasses: Karen Walker Shop the Look: I can not tell you how happy I was yesterday when I woke up and it finally felt a little like Fall! It seems like I have been waiting for it to cool down for forever. So of course I had to wear my new hunter boots! I am so excited about these. I have been wanting the red for a long time so I am sure you will be seeing a lot of these (even when it is not raining). 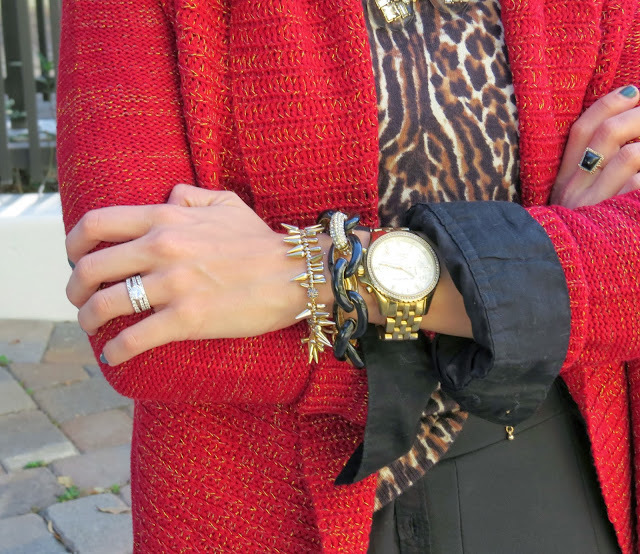 I have been wearing this chunky red sweater from The Crystal Feather Boutique nonstop (even when it is warm outside). I love big comfy sweaters and I am really loving all things red, which I am sure you all have noticed by now. This sweater goes with so much! Especially my new boots! It will be a staple in my Fall/Winter wardrobe. Thanks so much for stopping by! I hope you all had a great weekend. Happy Monday. I love wearing my Hunters all the time too. Yours are a fabulous color and definitely worthy of wearing all the time! This is so cute and I'm obsessed with your rain boots! LOVE those red Hunter boots! Red is made for cheetah! WOW Jade you look absolutely fab wearing your red Hunter Wellies, I wear Wellies too, it would be cool to wear them together sometime. Love this look! Red looks so great on you! Jade, when you layer (button ups & sweaters) do you have to buy different size in each so they layer nicely? i can't seem to get it right. it's always bunch or the sweaters stretch out too much.. HELP! That red sweater is gorgeous—definitely a stand out! LOVE the red Hunters and sweater with the leopard top. Looks fabulous! I wish it were cold enough for sweaters in Orlando... it was 90 today. Boo. Hope you're having a great week! Cute sweater! I am loving all of the RED! Those boots KILL it. Happy to have found your lovely blog! Those red hunters make me ridiculously happy.